Centipede ("hundred legs") is the common name for any member of the arthropod class Chilopoda, comprising species with long, flattened bodies with many segments, and with one pair of jointed appendages on each segment except the last two. The appendages on the first segment take on the form of jaw-like, venomous claws with poison glands that are used in capturing prey. There are more than 2,500 known species. Centipedes are typically fast-moving, predatory, terrestrial arthropods that feed on insects (such as flies and cockroaches) and other invertebrates, and even small vertebrates. 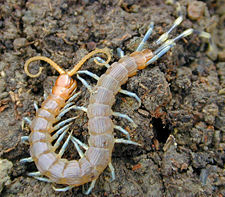 Chiefly nocturnal, centipedes are found primarily in tropical climates, but are also widely distributed in temperate zones. Some species are highly venomous, but human deaths are very rare. Centipedes play key roles in food webs. Furthermore, the house centipede, which may be seen as a household pest to be exterminated, actually is one of the most beneficial creatures to inhabit human dwellings, consuming actual household pests like bedbugs, termites, cockroaches, and so forth. Scientists who study centipedes are called myriapodologists. As arthropods, centipedes have a segmented body and paired, jointed appendages on most segments. Like the millipedes, which they resemble, centipedes are highly segmented (15 to 173 segments). However, millipedes have a cylindrical body with two pairs of legs on most segments, while centipedes are dorso-ventrally flattened and have only one pair of legs on most segments (excepting the hindmost segment). Despite their common name, which stems from the Latin words centum (meaning "hundred") and pes, pedis (meaning "foot"), they normally have around half that number of legs, though it is possible to find centipedes with over 200 legs. The head of a centipede has a pair of jointed antennae. The most anterior trunk segment of a centipede has a pair of venomous claws, called maxillipeds, that are used for both defense and for capturing and paralyzing prey. As with all arthropods, centipedes are covered by a hard exoskeleton, made out of protein and a tough polysaccharide called chitin. This exoskeleton provides support and protection, but must periodically be shed when it grows and molts. Centipedes are among the the fastest and most agile of non-flying arthropod predators. The bite of a smaller centipede in temperate areas may be similar to a bee sting, but the bite of a larger tropical species is excruciatingly painful, leaving two black puncture wounds about a centimeter apart. Scolopendra gigantea (the Peruvian giant yellowleg centipede, or Amazonian giant centipede) is the largest extant (living) species of centipede in the world, regularly reaching lengths of 26 centimeters, and can even exceed 30 centimeters (12 inches) in length (Shelley and Kiser 2000). It inhabits the northern and western regions of South America and the islands of Trinidad and Jamaica, and is known to eat lizards, frogs, birds, mice, and even bats. The extremely potent venom, containing acetylcholine, histamine, and serotonin, is toxic to humans and causes severe swelling, chills, fever, and weakness. The prehistoric Euphoberia was the largest known centipede, growing up to one meter (39 inches) in length. 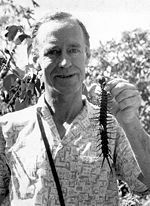 There are rumors that the Galápagos Islands giant centipede (Scolopendra galapagoensis) can reach sizes of up to 25 inches, although these rumors may result from the rarity of the particular centipede. Captive Galapagos centipedes do not often exceed 8 inches in body length. Centipedes are chiefly nocturnal, common in temperate and tropical regions, generally living under rocks or logs, in forest litter, or in soil. Male centipedes spin a small web onto which they deposit a spermatophore for the female to take up. Sometimes this involves a courtship dance, but sometimes the males just leave the spermatophore for the females to find. In temperate areas, egg laying occurs in spring and summer, but in subtropical and tropical areas there appears to be little seasonality to centipede breeding. Species of the Lithobiomorpha and Scutigeromorpha orders lay their eggs singly in holes in the soil, which the female then fills in and leaves. The young usually hatch with only 7 pairs of legs and gain the rest through successive molts. Scutigera coleoptera, the American house centipede, hatches with only 4 pairs of legs and in successive molts has 5, 7, 9, 11, 15, 15, 15, and 15, before becoming a sexually mature adult. It takes about 3 years for S. coleoptera to achieve adulthood; however, like millipedes, centipedes are relatively long-lived when compared to their insect cousins. The European Lithobius forficatus can live for 5–6 years. Females of the orders Geophilomorphapha and Scolopendromorpha show far more parental care. The eggs, 15–60 in number, are laid in a nest in the soil or in rotten wood. The female stays with the eggs, guarding and licking them to protect them from fungi. The female in some species stays with the young after they have hatched, guarding them until they are ready to leave. If disturbed, the females tend to either abandon the eggs, or young, or to eat them. Abandoned eggs tend to fall prey to fungi rapidly, and thus breeding is difficult to study in these species. The very large female S. gigantea centipedes, a member of the Scolopendromorpha order, exhibit parental care, guarding and tending their nests of eggs. The house centipede (Scutigera coleoptrata) of Europe and North America is a fast-moving carnivore that is common in dwellings. Most house centipedes live outside, primarily under large rocks, piles of wood, and especially in compost piles. They prefer cool, damp places. Within the home, these centipedes are found in almost any part of the house; most commonly, they are encountered in basements, bathrooms, and laundry rooms, where there is a lot more water, but they can also be found in dry places like offices, bedrooms, and dining rooms. The greatest likelihood of encountering them is in spring, when they come out because the weather gets warmer, and in fall, when the cooling weather forces them to find shelter in human habitats. Unlike its shorter-legged but much larger tropical cousins, the house centipede can live its entire life inside a building. House centipedes feed on spiders, bedbugs, termites, cockroaches, silverfish, and other household pests. They kill their prey by injecting venom through their fangs. Because they eat household pests, house centipedes are considered among the most beneficial creatures that inhabit human dwellings, but because of their alarming appearance, frightening speed, and painful bite, few homeowners are willing to share a home with them. They do not cause damage to food or furniture. The house centipede is capable of biting a human, but this seldom occurs. Eason, E. H. 1964. Centipedes of the British Isles. London: Frederick Warne. Molinari, J., E. E. Gutiérrez, A. A. de Ascenção, J. M. Nassar, A. Arends, and R. J. Márquez. 2005. Predation by giant centipedes, Scolopendra gigantea, on three species of bats in a Venezuelan cave. Caribbean Journal of Science 41(2): 340–346. Retrieved April 1, 2007. Myers, P. 2001. Chilopoda. Animal Diversity Web. Retrieved January 14, 2009. Shelley, R. M., and S. B. Kiser. 2000. Neotype designation and a diagnostic account for the centipede, Scolopendra gigantea (L. 1758), with an account of S. galapagoensis (Bollman 1889) (Chilopoda Scolopendromorpha Scolopendridae). Tropical Zoology 13(1): 159–170. Debunking of some centipede myths, by American Tarantula Society. This page was last modified on 23 January 2017, at 20:15.